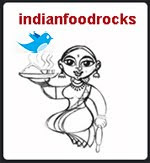 Indian Food Rocks: And that's Indian, you say? Now that we have that out of the way, I'd like to confuse the issue with the fact that East Indians exist. Is your head swimming now?! Or maybe you think I've lost it completely! East Indians are a Christian community based in and around my hometown of Bombay, in the state of Maharashtra. This community speaks a dialect of Marathi and were converted to Christianity by the Portuguese. When the Marathas finally defeated the Portuguese in the mid-1700s, they claimed victory over Vasai, the capital of Portugal's northern Indian colony. Vasai, formerly known as Bassein, is a suburb of Bombay where this Christian community flourished. Unfortunately, this victory translated into a less than desirable fate for this community; their churches were pillaged and there were forced conversions back to Hinduism. When the British showed up, this community aligned itself with the new rulers hoping not to suffer further persecution. They started calling themselves East Indian, in allegiance to the British East India Company. It's perfectly alright to call this community East Indian, because as you may have noticed, they want to be called that. They have a cuisine that draws from the local Maharashtrian cuisine, blended with Portuguese flavors. 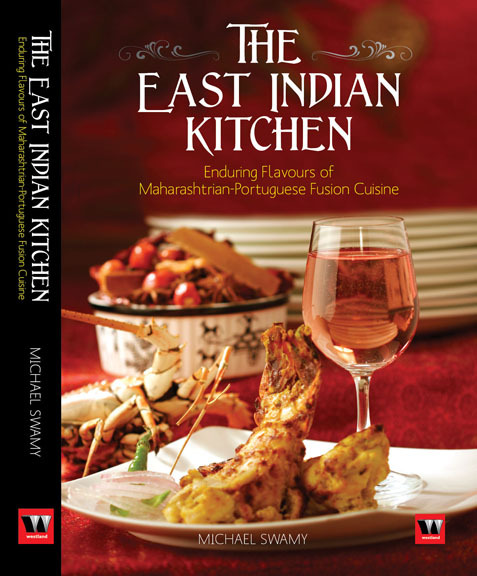 Recently when I was looking up East Indian dishes, I came across a new cookbook called The East Indian Kitchen, Enduring Flavours of Maharashtrian-Portuguese Fusion Cuisine by Michael Swamy and I had to buy it. I don't think the book is available in the US, or outside of India for that matter. And perhaps rightly so as the measures for the ingredients are largely India-centric. The East Indian Kitchen has an interesting section on the history and culture of East Indians. There are several pages worth of spice blends and mixes, the most well-known being the East Indian bottle masala. It is called that because it is stuffed into tall bottles and it continues to be sold that way! The more I read this book, the more it invited me to try the recipes. I am not always this lucky with regional Indian cookbooks. Last year when I had picked up a cookbook in Marathi, I thought it would be Maharashtrian cuisine but it turned out to be a cookbook with all manner of vegetarian recipes, even chocolate brownies. This cookbook, however, keeps its promises and soon, I had decided that dinner on New Year's Eve would be completely East Indian, with adapted recipes from Michael Swamy's latest cookbook. We started with khimad, an alcoholic beverage that relies on a sugar syrup that is reminiscent of sweetened spiced chai. The soup course had Portuguese flavors, sopa lentilha com toucinho, followed by cabbage foogath, mutton curry with red masala and steamed basmati rice as the main course. I picked up locally-made ice cream for dessert. The soup? It's made with yellow split peas or chana dal. And, yes, it's soup. And, also, it's East Indian. Have I lost you now? I hope not because you want to make this soup. It's very tasty and the toucinho—bacon—makes it divine. People, Indian not East Indian. Dal is not a soup. East Indians are a small community based around Bombay. 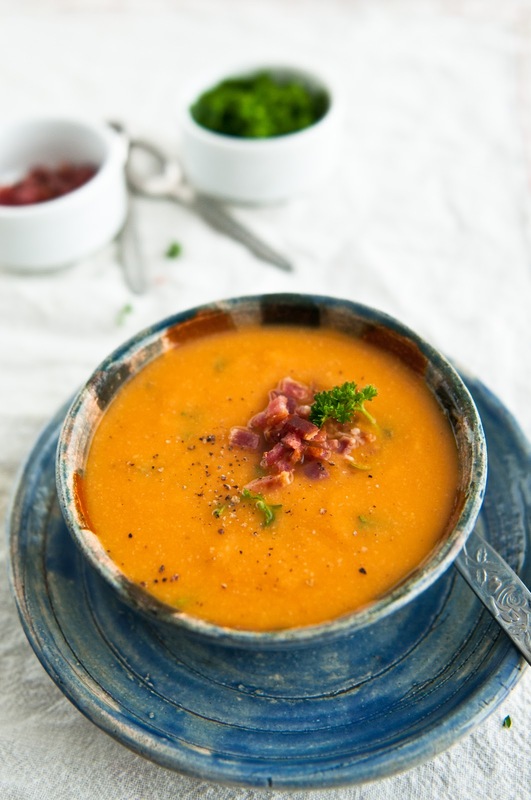 This recipe uses dal and is a soup. Wash and soak the dal. In the pan of your pressure cooker, heat ghee and sauté the chopped onions over medium heat, until translucent. Add garlic and celery. Sauté for another couple of minutes until fragrant. Add black pepper or green chillies, depending on which you are using. Drain the dal and add to the pan. Add water, cover and cook under pressure until the dal is soft. That's three pressure releases or whistles in my pressure cooker. 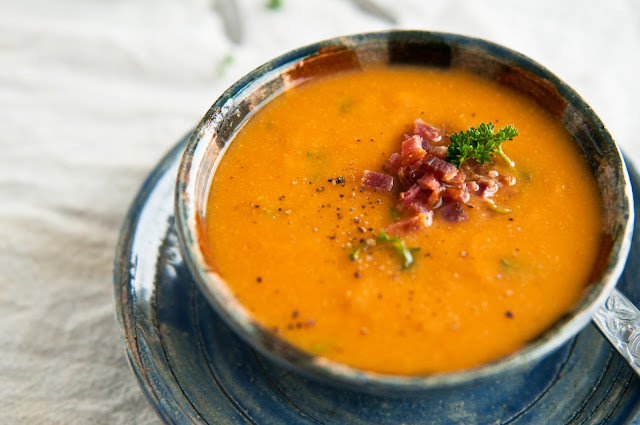 Use a hand blender to blend the soup to a coarse purée. Adjust seasonings and serve hot, garnished with bacon bits and chopped parsley. If you don't have a pressure cooker, wash and soak the dal for at least a couple of hours or do a hot soak. Bring the dal to a boil in 6 cups of water, then lower heat and cover the pot leaving a gap to avoid spills. Simmer until tender. While the dal is cooking, cook from step #2 through #5, add the cooked dal and continue from step #9. If you don't have a pressure cooker, I have to ask: why? Michael's recipe used freshly ground black pepper but since Medha is not a fan, I used green chillies. I would strongly recommend adding a grind or two of crushed black pepper just before you dig in. Skip the bacon to make it vegetarian. Although the bacon bits take it to another level. Michael's recipe uses chana dal to make this soup. I used yellow split peas as they are more readily available here. Despite what any label on a packet of chana dal (Cicer arietinum, a legume) might say, chana dal is not the same as yellow split peas (Pisum sativum, a pea). In the Netherlands, Indonesia (a former Dutch colony) is referred to as Oostindië (East India), because it's located east of India. To make matters even more complicated, Indiaas (Indian) is often used to describe people or things which originate in Indonesia. 'Eeen Indiaas restaurant' would more often be an Indonesian restaurant than an Indian restaurant (the latter of which are incredibly rare here in Rotterdam, and most of them not very good either). isn't it ironical that East indians are from the west of india? Great informative post Manisha. Especially as the Indian cricket team are in Australia currently. Very interesting bit of history there. And the soup (or was it soup) looks amazing! BEAUTIFUL piece... Loved the part about the pet Peeves. (something that must be on many minds, but never got articulated with such clarity!). Great way to get inspired for 2012!! I live in Arizona, USA, and have never heard of the term East Indians. I am glad to learn the history behind it. We do have many bands of native peoples here which are called Indians by white people in Phoenix. And to refer to another kind of Indians we say "Indians from India" because the majority of Indians here are native peoples. I like learning things on your blog. And making your wonderful recipes! Happy New Year! Very interesting post for me as an Indian woman married to a Portuguese man! I have always called people from India Indians. I call the other people Native Americans, at least now. I want this soup. I saw the pic in flickr and as you wrote there i wanted to know what you were ranting aobut :-) Loved reading the post,I didn' tknow that we Indians were called East Indians in US. I agree with cybergabi, about holland, i remeber my MIL saying when i first came here hat she had been to a Indian restaurant for dinning and then it is later i found out it was inoneasian food. I love the recipes and love the information Manisha. Very interesting. I have the same problem with people and their mis-inforaation - like calling Asians in general, anyone from Korea, China and anywhere other than Japan or India, which they seem to have figured out. I usually ask them which country they are talking about in Asia, as Asia is very broad. They cannot answer that one. We have Fiji Hindi here in Fiji, which is a mixture of Indian languages from when the ships first arrived in Fiji from India. They couldn't understand each other's language, so developed Fiji Hindi. My father was brought up in India, and spoke India Hindi fluently. When he arrived here, they didn't know what he was talking about so had to re-learn Fiji Hindi. Also we spell Dal - Dhal here. Love your recipes. Gabi, does anyone correct them or do the Indonesians just accept it as that is the way of the Dutch? Sig, you are the trendsetter! Did you know whether they used it to refer to you as a person from India or if they thought you were a real East Indian from Bombay? The knife, totally! I actually had that piece of information in there but deleted it as it made my head swim! Barbara, thanks and the Indian team isn't doing very well, is it?! notyet101, it is! Make it with chana dal or matar ki dal. Niv, I first encountered it in about 2006 or so. I brought it up with Monica about her article on NPR but she said she has no control over the title as that is written by an editor. I would have asked for it to be changed. DesertNails, thank you for that piece of information! I'm glad it's not as widely used as it once used to be! I was told a very convoluted story in 2006 that I would prefer to forget but it led to the discovery that yes, Indians are called East Indians. What is worse is that Indians call themselves East Indians because "that's how it is in the US." In the past, I have seen copies of US newspaper articles dating back to the 1960s which referred to people from India as East Indians. Mistress, ha ha! If you have any children, they will be called Mestizos (of mixed blood), according to Michael's book. Is there a similar soup in Portuguese cuisine? Leslie, thank you! Make the soup! Gay, it was the reverse in Kenya. An Asian was someone from India, Pakistan or Sri Lanka. There were Kenyan Asians and then there were Indian expats. People from SE Asia were known by their nationality. Oh and you live in such a beautiful place! I want to visit Fiji! One of my neighbors assumed that I would know Fiji Indian cuisine because I was Indian. I had to explain that, at the most, I would be able to spot similarities if presented with a recipe but that was it. As you know, Hindi is a phonetic language and any words we write in English are transliterated and only approximate as most of the sounds do not exist in the English language. To add to the confusion, I make many mistakes while transliterating. Dh implies an aspirated sound (ध) whereas D is used more for द, the sound that dal (as we say it in Hindi) begins with. But that's Indian Hindi and not Fiji Hindi. What do you use to write Fiji Hindi? Devanagari, English alphabet or your own script? Enjoyed reading the post. I know sometimes these terms are really frustrating. Its nice to see it being pointed out! The "soup" looks great! Manisha, the Fiji Hindi Script is Devanagari. Yes, you must visit us one day. Meanwhile as you probably know already, there are many ex Fiji people living in Canada. I have a girlfriend there, who is organising aa trip to India for a gorup of us in November this year hopefully. My first trip, but my son has been there before. Really exciting, and I can't wait for the sights and food. saw this on FG. congrats! I think of you often and our time at the food & light workshop. Happy 2012! Gay, that is so exciting! I hope everything falls into place and you have a memorable trip! Don't forget to come back and share your experiences with me! Averie, that was a fun two days! And I enjoyed our chat! Hugs to you! Soak the dal?! :shock: Have you started mollycoddling your dals finally? I was very confused about this East Indian business here till you enlightened me a few years ago. I do love their versatile bottle masala and if there's a recipe in that book - I'm buying it! Great summary at the end; should make it crystal clear to any brains still foggy. And here I thought maybe, just maybe I was an East Indian, never sure where you belong. Huh! Honestly i'm tried of explaining people around about dal, next time i'm ask i will fwd them your page ;) Enjoyed reading the whole history, rarely it is! and fwd about the book to my Indian friend who married a Portuguese, and dal looks wonderful and bacon i will think about it! I am sorry but I dont think so Goans would want to be called east indians. Right now the hindu and moslem community is taking over goa, I would say even they r messing it up. Most of the christians in bombay and pune are goans anyway. Colonization was not good and often horrible, I agree, but because india was a colony it is better developed. That anybody can see >>> example goa. Helene, I am not sure if I understand you correctly. Is Goa getting messed up because it is inhabited by non-Christian Indians? India is a free country that does not differentiate on faith and people of all faiths are free to live anywhere they chose. Similarly, Goan Christians are free to live in Bombay, Pune, Delhi or wherever they chose. Before the Portuguese and the Arabs arrived, there were people (later called Hindus) living in 'Goa', and not all of adopted Christianity. Are you saying we should instead allow 'aliens', such as yourself, to "take over the place"; or colonise us? If you read a little you might discover that the colonisers gained more than the colonised did! We would have fumbled along just fine without the help. Why Goa is better off than a lot of places in India is more complicated than the fact that it was a colony - which all of India was. I don't appreciate the scorn you seem to have for non-Goan Indians. I had no clue we are called east Indians! This post is amazing and I hope they got the message. So glad you found the bottle masala before I did. Very unhappy that you did not share it with me. Hmmph! John, HNY to you, too! I have a long list of pet peeves! You have been forewarned! The less said about the Indian team, the better. BM, the year is going really well. I'm sorry the East Indians stole your thunder but India is a complicated place, no? That's the biggest part of its charm! Ananda, thank you! The soup is very filling and I can see it being a one pot meal on weekdays. If you try it, let me know what you think! Helene, I'm not sure how you made the leap and brought Goans into the picture! All Christians in India are not Goans, just as all Goans are not Christians. East Indians are a Christian community from Maharashtra. Click through to the links in my post and you can read about their cultural history. Or since you are in India, you could buy Michael's cookbook from FlipKart and read his essays, which I think are very informative. Additionally, all Indians in India are free to live where they wish regardless of their religion or community. This Hindu-Muslim-Christian thing *has* to stop. Apart from stripping India of its wealth, this is what the colonizers did to us: divided us and it still persists more than sixty years after independence. I'm sorry but I do not agree with you that this was good for India. Please do not spread more parochialism or incite communalism this way. Sunshine, it's definitely used in the midwest and by NPR. Can you imagine that? NPR! Mmmmm! Bacon! Love this Manisha. Though I grew uo with dahl as you describe it in recent years I make on almosy a weekly basis more liquidy version and have it as a soup:). I love th epiece of history about the East Indian community in India. & Yay for Maharashtra, both my parents as you might know are frm ther. The dahl here is a complete different version from how I & my mom make it but there are numerous versions:). Beautiful! I didn't know you would want bottle masala since you were headed back to Bombay! You've tasted it though, haven't you? I worked for years on a Native American reservation. There is lots of picky-ness over what each person seems to want to call themselves. Because there's a large "Indian"
I am an East Indian and it was nice to see this post albeit late. a few small notes..(from some conversations with some of my East Indian uncles and my grandmum...I was still a toddler when my granddad passed away...he was one of the few senior officers in the then GIP or the Great Indian Railway) there was actually a big problem when the British came in..very few from this community knew English and the British resented the Portuguese heritage...some of the differences in the Goan and East Indian heritage is the Anglicizing of family and first names. My great great grandfathers name was Eduardo D' Almeida which was changed to Edward Almeida and my grandmum who saw hard times realised how important it was to embrace the British to ensure they were safe and hence a large section of the East Indian community started speaking English. Also the name East Indians came from the British as they were handed over the islands of Bombay which the administration also referred to as the East Indies!